From WRAL….Benson, N.C. — To drive down Godwin Lake Road in Benson is to enter a true winter wonderland. Elaborate holiday light displays line the road until grand finale, Meadow Lights, an enchanting drive-through Christmas light display. Roy Johnson, owner of Meadow Lights, has been creating the tradition for thousands of families on his 30 acres of land for over 40 years. Meadow Lights features dozens of commercial light displays. From the conventional nutcracker and Christmas to the kitschy roller coaster and fishing boat, Meadow Lights has it all. Visitors can walk around the displays or hop aboard a train to view the lights. 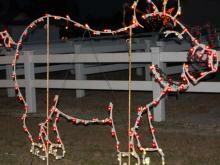 “It all started 40 years ago, when I had my boy and girl and we would decorate the yard at Christmas,” Johnson said. Residents would come by to see the Johnson family light displays each year. Eventually, the displays got bigger – and so did the crowds. In 1994, Johnson added the train and the country store to the experience. Today, the property features a train station, carousal, concession stand, country store, and even Santa Claus. Thousands of people visit Meadow Lights each season, between the weekend before Thanksgiving and December 31.